Storm damage, road construction, you name it. 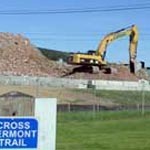 Check here for updates on temporary changes or impacts to plan around along the Cross Vermont Trail route. Use this information in addition to the information in our maps and cue sheets. UPDATE: Marshall/Kimball Avenue reopened, stay tuned for discussion about long term fix. Cross Vermont Trail Association has long advocated for connecting the Williston and South Burlington bike paths - they both come close to the Marshall/Kimball Ave crossing of Muddy Brook, but neither quite make it over the brook. If the road needs significant repair in the future, that could be great time to build the path at the same time. We hear from both municipalities that they like the idea in concept - and so we are aiming to keep it on the front burner as plans for the road progress. Read the 2 page upshot of many years of engineering studies about a bike path across Muddy Brook. Section of Marshall/Kimball Avenue Closed. From the Town of Williston: "The culvert underneath a section of Marshall Avenue is failing and is affecting the structural integrity of the road. This involves the section of Marshall and Kimball Avenue that crosses the Muddy Brook between Williston and South Burlington. Crews are on the scene to assess the situation and to determine how best to repair the damage. Until it is repaired, traveling over the road is considered hazardous so the road will remain closed. Motorists are encouraged to find alternate routes and check the Town of Williston�s web page or Facebook page for future updates. It is likely that the road will be closed for an extended period of time." Link to Town of Williston website. This notice affects Map 12. The big blowout in East Montpelier. The big blowout in East Montpelier is on the rail trail section about half way between Rte 14 and Country Club Rd. It happened in May 2011 and we are still working on a permanent fix. Learn more here. This notice affects Map 5. The Waterbury State Office Complex was under construction during 2014 and 2015. During this time, the trail route was temporarily adjusted to accommodate. As of May 2016 the trails around the back side of the new office buildings are officially being reopened. (Huzzah.) Watch for notices and signs posted on site or see more details here. This notice affects Map 8. 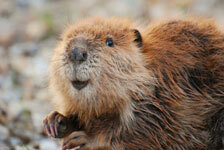 Beavers repurpose railbed as dam. We can't fault them for repurposing the railbed, that'd be the pot calling the kettle black. At various times, it ebbs and flows, beavers will block culverts under the old railbed and use it as a dam to make their pond. Sometimes they (busily) build their dams up taller than the old bed, and water spills over onto the trail making large puddles. It's dramatic and cool to see. Many people can just splash through. However, it does make the going more difficult. Previously this was happening in the Wells River Conservation area behind Blue Mountain Union, and currently is happening in Groton State Forest west of Lanesboro. This notice affects Maps 1 and 3.